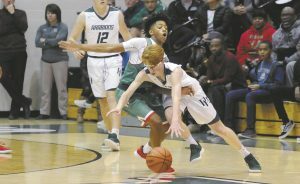 PENDLETON — The Indians led by as many as 16 and cruised to a 65-63 win at Pendleton Heights. A hot stretch by Anderson from late in the first quarter to the 3 1/2-minute mark of the third turned out to be too big of a hole for the Arabians to dig out of, and PH had to fight from down 48-32. Joseph Jones led Anderson with 16 points, all in the first half, and freshman reserve Daveyon Turner also was hot in the opening 16 minutes, with 10 of his 12 points. Starters Tyquez Priester and Brandon Haralson each chipped in 11 points for the victors. While pleased with his team’s grit, PH coach Kevin Bates said his side didn’t do enough to stem the Indians’ tide. Anderson didn’t trail from the midpoint of the first quarter on and broke a 12-all tie with a 7-0 run bridging the first two quarters. Jones made the go-ahead basket, then scored seven in the first four minutes of the second quarter, and helped the Indians build a 26-15 lead. It was 36-25 at halftime. The Indians had another hot spurt at the start of the second half, parlaying a 38-30 lead into one of 16 by the 3 1/2-minute mark. A three-pointer by Jesse Sawyer and four free throws by Haralson, made it 48-32. PH would counter with a 6-point run, with two baskets in the lane by Damieon Warrum and the other by Tristan Ross, and the Arabians closed to within 55-49 on a back-door bucket by Warrum, from Walker Stull (in his varsity debut). With three minutes left, Christian Jones bagged his fifth triple of the night, and after an Anderson turnover, sophomore Devrick Black followed suit from downtown, and it became 59-57. On the Indians’ next possession, Turner made a cut toward the open lane and laid it in, and after Warrum missed two foul shots, Haralson made two himself and the spread again was six. Warrum hit a pair of freebies and scored off a turnover, both within the final four seconds, to make the final margin two. PH shot 43.4 percent (23-of-53) and made 10-of-20 three attempts, as well as seven of 13 free throws. The Indians were deadly at the line, 21-for-24 (Haralson was 9-of-10). They were 19-of-45 from the field (42.2 percent) and 6-of-18 from beyond the arc. “Anytime you can get a win on the road at Pendleton, I’ll take it,” Elliott said. In the junior varsity game, AJ Baymon hit a 15-footer at the buzzer, lifting Anderson past PH 52-50. Marcus Armstrong scored 16 and Baymon 15 for the Indians, and Luke Candiano led the Arabians with 15. Anderson hosts Lapel Friday and PH is at home to Westfield next Tuesday. This article appears courtesy of The Herald Bulletin, which has covered AHS sports since 1893. Click here to subscribe!